In addition to iatrogenic hyperthyreosis due to excessive iodine administration in the form of iodinated contrast media or certain drugs, hyperthyreosis can also be caused by Basedow’s disease. This disease, called Grave’s disease in the English-speaking world, is characterized by elevated thyroid gland hormone levels, whose effects lie outside the thyroid. Causative are autoantibodies against the TSH receptor, which is competitively occupied and the thyroid therefore continuously stimulated. Basedow’s disease is therefore an autoimmune disease. 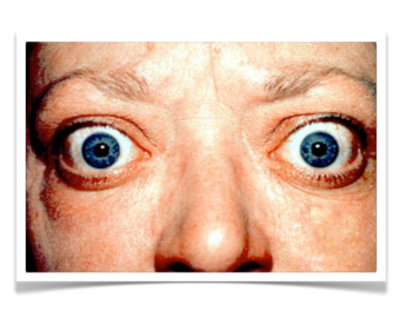 In addition to the known hyperthyreosis symptoms such as tachycardia, irregular heartbeat, and heat intolerance, Basedow’s disease can also cause typical exophthalmos. Though not always pronounced, it constitutes a visual diagnosis in the truest sense. The phenomenon is cause by changes in the retrobulbar fat pad, whose cause is not entirely clear. Treatment of Basedow’s disease is mainly conservative. Drug treatment is used to soften the negative effects of hyperthyreosis by administering e.g. beta blockers. An attempt can also be made to weaken the influence of autoantibodies by blocking them from the receptors. This „blocking“ of the thyroid can be achieved e.g. with carbimazole. After about one year a withdrawal of therapy is attempted. Only if recurrence occurs or if the therapy does not have the desired effect should a surgical resection (Sanierung) of the thyroid be considered. Or radioiodine therapy. Radioactive iodine is taken up by the thyroid and destroys it from within. Because radioactive iodine is a beta emitter, the surrounding tissue is only minimally burdened by the irradiation. This therapy is also used for adjuvant treatment of differentiated thyroid carcinomas. 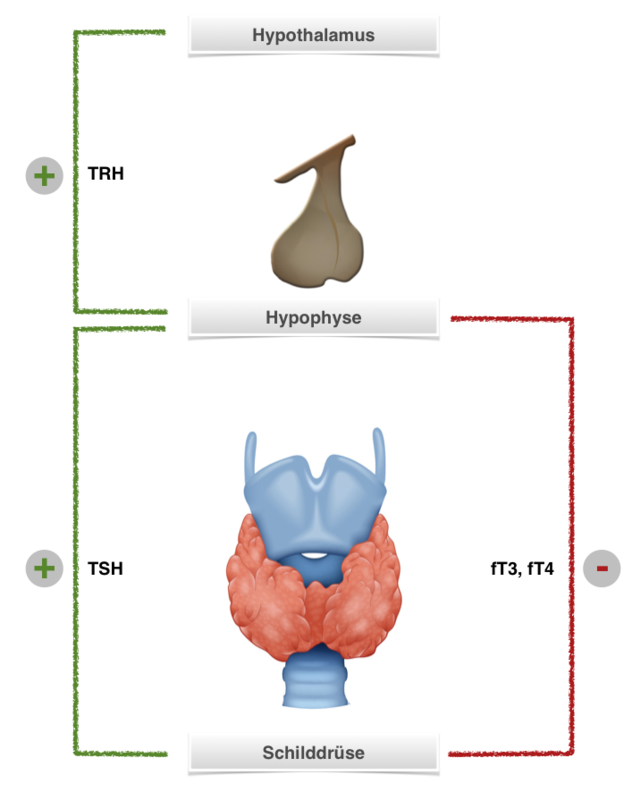 Individual areas of the thyroid can uncouple from the hypothalamic–pituitary–thyroid axis causing unregulated production of thyroid hormone. 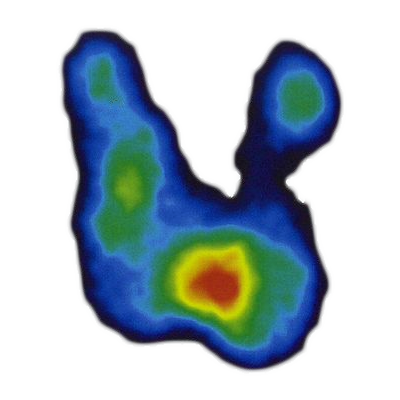 In thyroid scintigraphy, these autonomous areas show as hot nodules with elevated metabolic activity. They too can be treated with radioiodine therapy or surgically removed. Inflammation of the thyroid can also induce hyperfunction, especially in the acute stage. This clinical picture, which is usually caused by a virus, can be accompanied by hyperthermia, globus sensation, and sore throat. Acute thyroiditis is differentiated from the subacute and chronic forms. The chronic form of thyroiditis is called Hashimoto’s thyroiditis. It usually causes hyperthyreosis only in its early stage, during further course patients tend to develop hypothyroidism and require replacement therapy with thyroid hormone. There is increasing fibrosis of the thyroid accompanied by loss of function. The subacute form of thyroiditis is called de Quervain’s thyroiditis and is accompanied by swelling of the neck and severe malaise. Therapy is chiefly conservative, surgery is only indicated if there are mechanical complications or if malignancy is suspected. Hyperthyreosis can also result from excessive administration of iodine, usually in the form of iodinated contrast media. Some drugs also contain large amounts of iodine, e.g. the antiarrhythmic drug amiodarone. In extreme cases a thyrotoxic crisis occurs, which is associated with a dramatic rise in body temperature, cardiac arrhythmia, and diminished vigilance. A patient with thyrotoxic crisis must be placed in an intensive care unit and given beta blockers and thyroid blockers to relieve symptoms. Patients may require intubation and muscular relaxation, sometimes even emergency thyroidectomy.